"Hot Springs, New Mexico, Ain't That Any More" was one of the headlines on April 4, 1950, in the Gallup Independent. 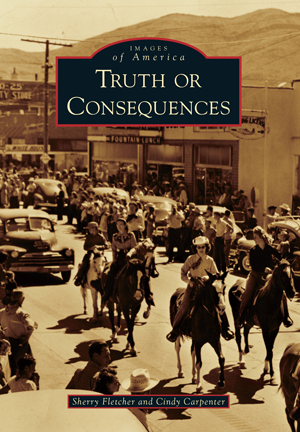 As a publicity stunt, Ralph Edwards had invited a town to change its name to "Truth or Consequences," the name of his popular radio quiz show, and Hot Springs agreed to do so. Since the late 1800s, the area has attracted health seekers to bathe in and drink from the area's hot mineral springs. The region is home to Elephant Butte Dam and lake, completed in 1916, which remains one of the largest irrigation dams in the United States. Carrie Tingley Crippled Children's Hospital, built in 1937 by New Mexico governor Clyde Tingley, utilized the natural hot mineral waters to treat children with polio. From the placement of the Hot Springs Bathhouse and Commercial District on the State and National Register of Historic Places to the centennial celebration of Elephant Butte Dam, Truth or Consequences continues to grow and develop while still honoring its heritage. Author Sherry Fletcher has been collecting historic materials from the area for over 40 years. For this collection, she and local writer Cindy Carpenter have compiled more than 200 vintage images, many of them never before published, from various local sources.